Anastasia asked us to research her family in Fontana Liri. This town played a big part in WW2 because it has a gunpowder factory in the lower valley which was very useful to the German invaders. As a result the townspeople suffered greatly. The old town, high up on the tip of the mountain overlooks everything and in the end this was where we went to search the parish records. A search usually starts with the civil records in the town office but Fontana Liri is now so small that when the anagrafe clerk retired he wasn’t really replaced. We know they have all the civil records back to 1809 but where they have stored them is anyone’s guess. One day we will go back and find them! 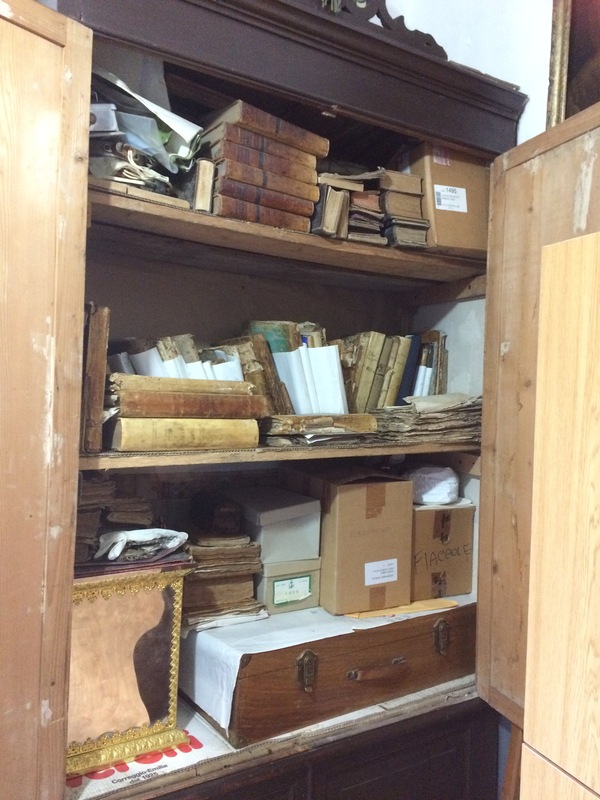 The parish records were stored in a wooden cupboard in a small room at the top of the church where the sacristan could keep an eye on the funeral cortege that was approaching the cemetery. Since he also looked after burials he left us to deal with that important chore. We took an inventory of the records as a service not only to ourselves but also to the Diocese office to whom we send a copy. As Rita started on the straight line search I began turning pages in the Stato d’anime, of which there were several and each of which were updated until the next one occurred. The Stato d’anime or parish census records vary from parish to parish and this one was a jewel of a find. There was no index so finding the family was slow but worth the time. The priest noted not only the father’s name but also the place of birth, if the person was confirmed, had had their first communion, and even that the final child was of an unknown father, presumably born to the daughter on the line above. Dates of baptism and death dates. A mine of information that would save hours of research later. Fascinating!!! I wonder where those records are – hope you find them soon !